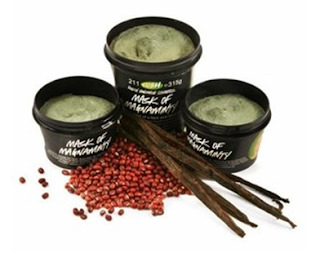 I bought Lush’s Mask of Magnaminty while on the search for a mask that would help control oil production and improve the condition of my pores. I finally settled on this mask, and not only because it’s by one of my favorite cosmetic brands. I’ve read so many great reviews on Mask of Magnaminty that I knew I had to try it! This mask is a little different than most others, when I put some on my hand in the store I noticed the consistency was chunky and thick…it’s not smooth at all (but in a good way). 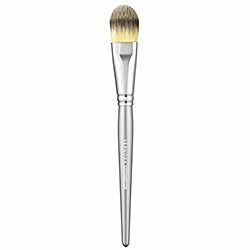 It’s hard to apply with your fingers, so (like with all my other masks) I apply it with a foundation brush, just like the one pictured below, and literally paint it on my face. The main natural ingredients are peppermint oil, honey, and ground aduki beans. This mask is an exfoliator, which you can feel as you apply it and as it sets on your skin. It also clears pores by lifting dirt up off the surface of the skin (think blackheads). The peppermint oil is cooling and tingling, but not in a uncomfortable way. Lush recommends leaving the mask on for about 15mins, I usually leave it on for about 20 then wash it off with warm water. When I bought the pot the woman told me it had about 20 masks in it, and there’s an expiration date which I like because it ensures the naturalness of the product and forces me to use it! Right now I’m using it once a week because I use another mask during the week as well. I’ve honestly noticed a difference in the texture of my skin, and I’m loving it! And, another plus, it smells great because of the minty-ness so it’s very relaxing at night! There are two sizes, a 4.4oz for $11.95 and the larger pot (which I bought) that’s 11.5oz and $22.95. When you do the math, for the larger pot, that’s $1.15 per mask…way cheaper than getting a facial!! PS: If you’re prone to acne on your back or chest area I’ve read this mask does wonders for those areas too! PPS: If you have a small breakout and want quick relief, you can use this as a spot treatment and not all over your face! I love this mask! I haven't bought it in awhile, think I might head over to Lush and pick one up! Great post! I've heard of Lush but have never personally purchased any of their stuff. Now that you say the mask has an expiration date I think it is the push I need to get something and actually use it!! 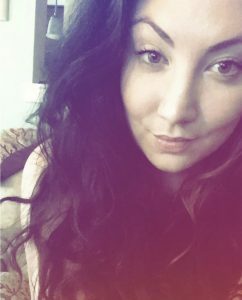 I would love your suggestions or advise on my blog (I'm a newbie and I love connecting with other students). I love a good mask and have wondered about Lush! Thanks! Next Next post: What’s In My Makeup Bag?? ?